In February 1883 three acres of land on the southeast corner of 800 South Street were bought by the Provo Bench School District No. 18 for $48.00. The residents built a log room 20 by 30 feet in size, with a large wood-burning stove in the center. Long rustic benches seating twelve students were placed on two rows on either side of the stove. In 1890 Edward Partridge built a brick addition to the log structure, providing one large classroom and a hall. In 1900, when the Lincoln School District was organized on the Provo Bench, the old log school room was torn down and additions were made to the brick room. 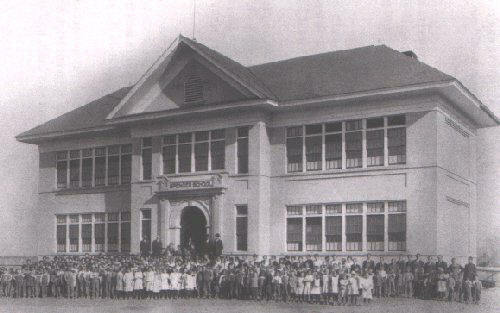 In 1912 a new two-story eight-room school building was built and was used almost continuously for the next eighty years, both for grade school and high school classes. It was sold and torn down in 1991 when the Spa Fitness Center was developed on the property. Spencer School was named after the curriculum textbook that was originally used in a young adult course taught at the school. They think they were the first classes ever taught there, an adult education that may have been a marriage education class as well, young couples were enrolled. So, the school started being called by the author of the textbook, whose last name was Spencer, but I don’t believe they know the full name of the author.